Staff members can now choose whether or not the registrant should receive an event confirmation email! When a staff member is registering someone from the back office, they will have a checkbox at the bottom of the registration form that says "Send event confirmation email to registrant" (screenshot: https://www.screencast.com/t/k53qay1Dlzi). This will be checked by default (so it will send one, unless unchecked). We received this item from UserVoice. Thank you for the votes and feedback! We strive to continually improve our reporting capabilities, to give you more flexibility when it comes to your data. With a few of the recent improvements we've implemented you may notice that some of your previously saved reports will need to have their filters reselected . Once your chosen filters are reselected, you can click save on your report and continue to utilize it. We apologize for any inconvenience this may cause. Please know, we are working toward a solution that will allow us to improve our reports without disrupting saved reports. The Contacts Report is now better able to pull addresses for contacts. You can now specifically pull one mailing address and one physical address. For cases where there are multiple addresses for an organization or individual, there is quite a bit of logic that goes on behind the scenes to determined the best one to pull into the report. All membership reports and all contact reports now have a filter (as well as a field to display) called "Membership Category". So you can now easily filter by Membership Categories. Now when viewing these reports, the Saleable Item Description has the discount name appended to the front if there was a discount applied. This will help staff users see if a discount was applied, as before it was difficult to know. 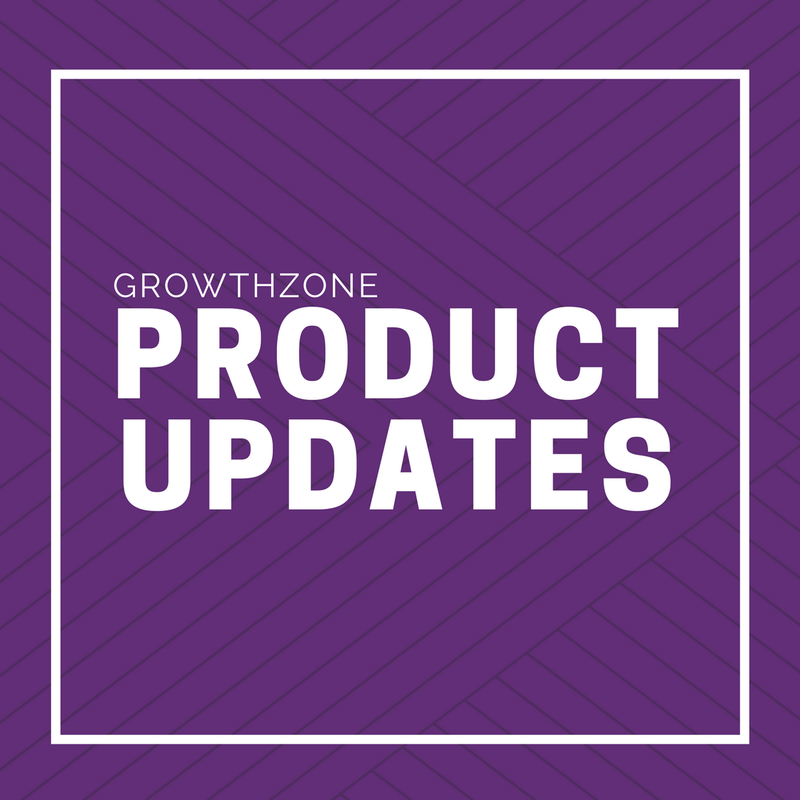 CHAPTERS: If your association has the GrowthZone Chapters module, you can now easily see your members' assigned chapters in a new Chapters section on the contact and/or organization’s profile tab. Not only can you assign chapters within your membership, but you will also have the ability to add or remove them when not tied to the membership. See a video on how this works: https://www.screencast.com/t/6YepQtodGPnp. INFO HUB: When creating a link (under Setup> Websites> Info Hub Setting> Links Tab), you now have the ability to give your custom left hand navigation Info Hub links an icon! To add an icon, you will need to visit FontAwesome.com. Watch this video for more details https://www.screencast.com/t/jsc7feKOQfYd. The following bullet points refer to the Info Hub section in User Access. To find these settings, go to Setup> User Access> choose the access level you want to edit or create new> then select "custom" in the dropdown for Info Hub. When customizing a user access level for the Info Hub, choosing "None" in the dropdown of a specific area means that section will no longer be visible to the end users with that access level. The ability to "hide" or "show" the Referrals section (that was previously located under Setup> Info Hub Settings) is now controlled right from the custom area in user access. Resources is now set the same way, under custom user access setup. See a screenshot of where to change this now: https://www.screencast.com/t/3AREto6n. In the Info Hub, the Account Tab now has separate user access level control from the Related Businesses/Related Contacts tabs (and Related Families if applicable). In user access, you will see "Individual Account Info" and "Organization Account Info" which are the two areas that control that Account tab, and you will see "Related Contact Info" which controls the related tabs. See where to find this: https://www.screencast.com/t/PtoPkaFQ. This gives staff members the ability to set individuals at a higher level for Account while still locking down the Related tabs if they are needing to prevent unauthorized users from potentially editing business information. In the Hub, users should now be able to edit their Payment Profile, located on the Account tab. We've now reduced the permissions needed to edit stored payment profile info. So as long as the Account tab is set to "View" or higher for a user, the Payment Profile area is accessible. There were times when a user had "view" access to an area in the hub, but they still had the orange pencil icon (although they weren't able to edit). This was causing confusion. To fix this, users with view access to certain areas will now see an eyeball icon instead. Making it clearer that they can view it, but won't be able to edit. The "Renewed Memberships" dashboard widget has been removed, as we have discovered it to be inaccurate. That said, we are working on a plan to get that dashboard widget to work correctly in the future. The "Overall Memberships Statistics" dashboard widget will no longer show just its renewal number statistic, for the same reason as above, inaccuracy. That widget will at this time only display the three statistics of: Active, New, and Dropped. We apologize for any inconvenience. NEW INTEGRATION: You now have the ability to sync contacts with HigherLogic! We sync (or push) our contact information based on the list/committee you choose. To set this up, find "HigherLogic" in the Integrations section of Setup, enable, and enter the Tenant Code that HigherLogic provides you. Then on the lists/committees of your choosing check the "Synchronize Contacts with authorized third party newsletter solution".